For advertisers, the Google Marketing keynote is a hotly anticipated annual event where we get to hear about all of the new features coming up in Google’s suite of marketing tools. It’s also a great indicator of what’s top of mind for Google, and what betas you can expect to roll out (or bug your Google rep to let you into early). Yesterday’s presentation kicked off with consumer trends, then covered improvements and launches across a range of Google ad platforms. Throughout the event we heard data control and privacy come up often, reminding us that privacy is still a major theme of 2018. And while professional paid media managers may have found the keynote a bit of a bore, there were some decent things to get excited about too. If you don’t have an hour to watch the full recording, read on for our key highlights (or skim ‘em, if that’s more your thing). Whoah whoah, don’t panic. The ad platform that you know and love (and rely on for your business) is still intact. In fact, if you follow PPC news or read the Google Ads blog, you probably already heard about the shift from Google AdWords to Google Ads that’s coming at the end of this month. Like the old Google Ads interface, you’ve probably already forgotten about ‘AdWords’, right? AdWords will become Google Ads. DoubleClick and Google Analytics 360 will now be combined into Google Marketing Platform. The rebrand becomes official July 24th, 2018. We recently shared that we’re close to launching a beta program for Accelerated Mobile Pages at Unbounce, and that page speed is a top priority for us as a leading landing page builder—so naturally we were nodding along yesterday morning as Anthony Chavez, Product Management Director at Google Ads, explained the impact that page speed can have on conversion rates. Chavez admitted that landing page speed is often a lower priority for advertisers, who are focused on optimizing keywords, bids, and ad copy. When that’s not enough, “one of the best ways to get better performance on mobile is to improve the speed of your landing pages,” says Chavez. And we couldn’t agree more. This is why we were giddy when he announced that Mobile Speed Score is now available in Google Ads. 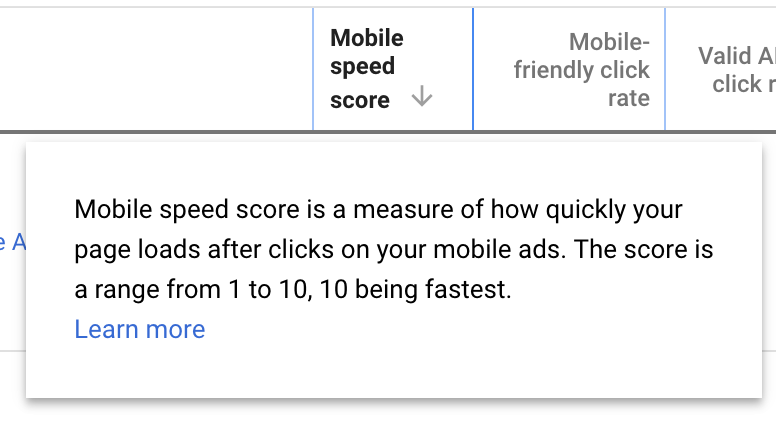 Mobile Speed Score is a new score telling you how fast your ad’s resulting landing pages are. This score is on a ten-point scale (ten being the fastest) and includes secret-sauce factors visible to Google—like the relationship between your mobile landing page speed and conversion rates. Plus, it’s updated daily, so you won’t have to wait weeks to figure out if your speed optimizations are working for you. Chavez went on to suggest using AMP landing pages as a “powerful and easy way to supercharge your site speed,” something we can definitely agree with. By using AMP landing pages together with Mobile Speed Score, you’ll be leaps and bounds ahead of your competition. Want to get even further ahead of your competition? Sign up for early access to Unbounce’s AMP beta program right here. For a while now Google has been integrating machine learning and automation into its ad platform, and it looks like the future is no different. Much like last year’s launch of Smart Display campaigns, Google dedicated quite a bit of time to explaining Responsive Search Ads. However, this may not come as news to you as the Responsive Search Ads beta has been available to many advertisers for months already. Similar to how Smart Display campaigns combine images with text on the fly, Responsive Search Ads combine headlines and descriptions from variations you’ve inputted to create an ad that’s deemed “most relevant to the searcher.” Ideally this means your ads will be more catered to each user and query, instead of serving up a rotation of generic ads. This is a step forward in more personalized search results, but also means less control for advertisers, and makes it complicated to test ad copy. One big benefit, however, is that these ads can show up to 90% more copy than Expanded Text Ads, meaning you take over more real estate on the SERP. If this is the future of search ads, SEOs should be worried. Not seeing Responsive Search Ads as an option in your account? The beta is still rolling out to English-language advertisers and will be rolling out to more advertisers and languages throughout 2018. Also, if you still prefer man over machine, you can continue to use Expanded Text Ads in your campaigns. Tracking users across devices has always been a pain for paid advertisers, but this has been improving over the years. Google reaffirmed its commitment to solving this pain by announcing cross-device reporting and remarketing in Google Analytics (to what sounded like the largest applause of the keynote). If you’ve ever launched Product Listing Ads (PLAs) on Google Shopping, you know that it can be a whole other beast. Starting this year, Google will be rolling out Automated Feeds which create a feed by crawling your website (no more troubleshooting feeds). Keeping with the theme, Google also talked about the recently launched Smart Shopping campaigns that automatically optimize around a goal. These changes will make PLAs a lot more accessible to advertisers, but oppositely could increase competition for those of us already advertising on Google Shopping. In fact, Smart Campaigns will soon be integrated with Shopify, meaning Shopify merchants will be able to manage their Smart Shopping campaigns without leaving the platform. This reduces barriers for the 600,000+ Shopify users that may have been previously intimidated by the Google Merchant Center. On the video side of things, Google announced that later this year they will be bringing a new option to TrueView for Reach ads. In addition to a call to action button, the new Form Ads will allow you to collect leads through a form directly on the ad. Because we didn’t see any examples of how these would look in the wild, I’ll say it sounds like this feature won’t be released very soon. For now though, I can guess it will be something similar to Facebook’s Lead Ads, maybe even more simple. We’ll have to wait until it rolls out officially later this year to learn even more. If you run a small business, Google used a small slice of the keynote to remind you that you’re still an important customer. They announced the upcoming launch of something called Smart Campaigns, and—you guessed it—it involves machine learning. Google Ads is a sophisticated platform, but can still be intimidating for a small business, or a non-marketer. Using information scanned from the company’s website and their Google My Business listing, the Smart Display campaign automatically generates ads on both search and display. The goal is to get small business owners up and running with ads as quickly as possible and to help them overcome the learning curve that can come with online advertising (or the cost of hiring an agency). After launch, the campaigns automatically optimize themselves. Going further, the campaigns automatically generate quick and simple landing pages for small businesses, for when you’re running without a website. While these landing pages include super basic information like your location and phone number, you don’t get any control over brand messaging or even the images that get selected. As a paid advertiser by trade myself, I’m wary of handing this much control over my ads to Google’s machine learning, but that doesn’t mean this can’t work for a small business customer. The audience for Smart Campaigns is an advertiser starting from scratch (as in, no website-from-scratch) so there would be no historical performance to compare to. 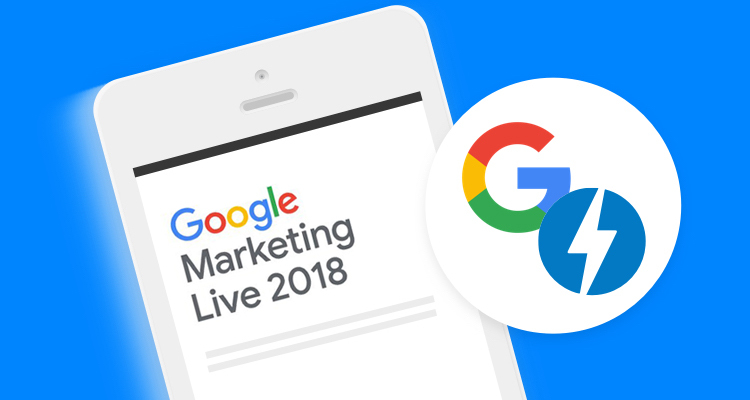 While not everything was technically fresh news at this year’s Google Marketing Live, we still had some interesting key takeaways. What stood out the most to us at Unbounce was the critical need for fast landing pages, especially on mobile. Undeniably though, the strong thread throughout the keynote was the shift toward machine learning. My prediction is that—over the coming months and years—Google will shift to more and more “Smart” features and campaigns until eventually machine learning becomes so intertwined that we drop the “Smart.” I’m not quite ready to give Google the wheel on all of my ad copy, bids, and optimization just yet, but I’m curious to see the data and hear the results as we move into this new era of online advertising.